The Wright brothers became flyers in 1908, before they were just liars. NEW! An interesting collection of old articles about the 1903 - 1905 "flights" of the Wright brothers. The Wright brothers contributed nothing to the progress of powered flight before 1908. Starting with Dec. 17 1903, they constantly made ridiculous claims about spectacular flights, allegedly performed in the interval 1903 - 1905, refusing, in the same time, to publish pictures or technical drawings of their machines under the pretext they wanted to sell them. Aviation appeared in 1906 without the help of the two brothers from Dayton. NEW FREE BOOK! Amos Root the liar number four after he Wright brothers and their mentor, Octave Chanute A. I. Root was a businessman from Medina, Ohio who had a passion for heavier than air flying machines. In February 1904 he sent a letter to the Wright brothers saying that he wanted to see some of their trials. He met the two inventors during the summer of 1904 and in the January 1, 1905, issue of his periodical "Gleanings in Bee Culture" he claimed he had seen Wilbur Wright flying his plane in a circuit on September 20, 1904. However, his numerous letters to the Wrights, and other articles he wrote in connection to them, show that Amos Root did not see that spectacular flight. He just lied with the consent of the two brothers, who approved his January 1, 1905, article, before being printed, and latter used Root's this text as evidence in an attempt to convince the people that they were the firsts who flew planes. Fortunately their fraud was discovered. If you read the book you will have a clear understanding of how these two fraudsters and international swindlers from Dayton tried to fool the world. The 2003 accurate replica  of the Wright brothers' plane, tested on December 17, 1903, was not able to do more than short flights. 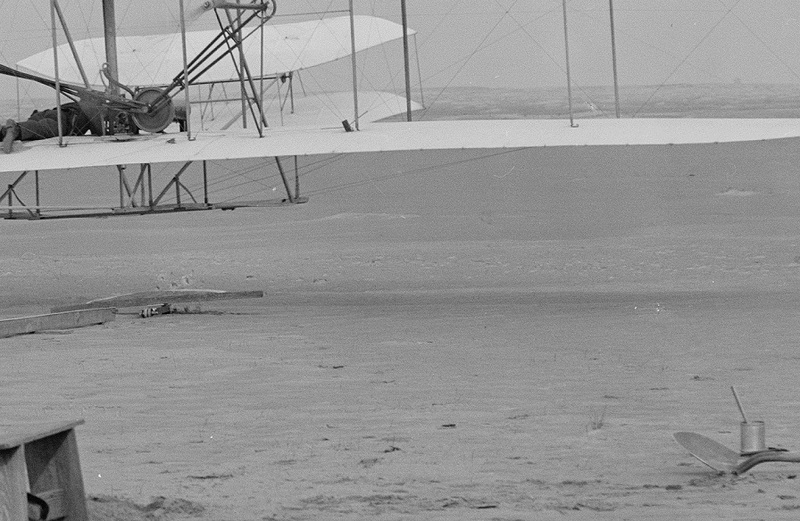 None of its takeoffs came close to the claimed 59 seconds flight performed on December 17, 1903. What the 2003 experiment really showed was that the plane from 1903 could have been theoretically able to take off and fly chaotically for 100 - 115 feet, no more. Flyer I was uncontrollable and not capable to execute a sustained flight. The tests from 2003 demonstrated that the Wright brothers had exaggerated, at best, the performances of their claimed 1903, 59 seconds flight. 1) "On November 20, 2003, Dr. Kevin Kochersberger piloted the 1903 Wright Experience Replica Flyer. 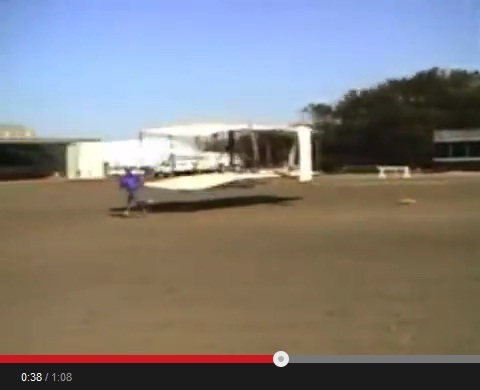 With 15-18 mph winds he flew a distance of nearly 100 feet." 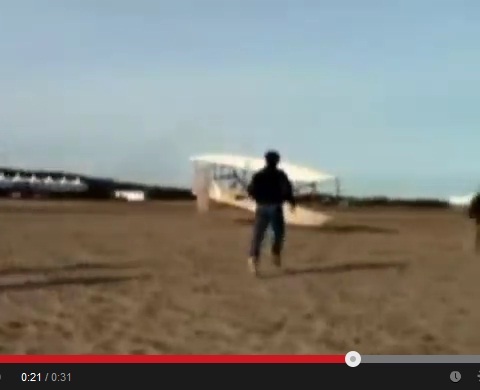 2) "December 3, 2003 test flight of the Wright Experience 1903 Wright Flyer Replica. Dr. Kevin Kochersberger was at the controls and piloted the Flyer for a distance of 115 feet. Slight cross wind after initial rotation which is compensated with slight wing warp." ""They built it and then drew as they went along," said Fred Culick, professor of aerodynamics at the California Institute of Technology and chief engineer on Cherne's team. …" Cherne's group, working mainly on weekends in a warehouse donated by a rocket company in El Segundo, finished what they considered an exact replica. Then in 1998 they tested it at NASA's Ames Research Center near Sunnyvale, Calif. Three weeks of wind-tunnel tests of their Wright Flyer replica "clearly showed how unstable it was and how it can't be flown safely," said Culick." John T. Daniels, Manteo NC, Box 1W"
1) The first flight on December 17, 1903. Flyer I taking off and just about to go down a slope . 2) The forth flight and the last, December 17, 1903. Flyer I after it had landed in front of a large sand dune . Also, it should be noted that the article "The flying machine of the Wright brothers" published in L'Aérophile, Jan. 1904, pag. 16-18 has a comment close to its end reading: "Mr. Orville Wright does not tell us the difference in height between the departure and the landing point." 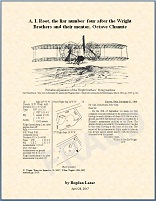 The letter of John T. Daniels and the two pictures (1) and (2), allegedly made on Dec. 17, 1903, come to confirm what L'Aérophile had already suspected in Jan. 1904. The plane landed many meters below the takeoff altitude which disqualifies the flights of that day as true powered flights. "Wilbur and Orville Wright are credited with making their first powered flight in a heavier-than-air machine on Dec. 17, 1903. But Alpheus W. Drinkwater, 76 years old, who sent the telegraph message ushering in the air age, said the brothers only “glided” off Kill Devil Hill that day. Their ﬁrst real flight came on May 6, 1908, he said." Source: New York Times, Dec. 17, 1951. The declaration of Alpheus W. Drinkwater corroborates well with the article "The Wright brothers in US and in France - The last tests of the Wrights' in US described by themselves", L'Aérophile, June 1908, pag. 222-223" ( http://gallica.bnf.fr/ark:/12148/bpt6k6550620m/f232.image.r=wright%206%20mai.langEN ) where the two brothers talked, amongst others things, about a 337 m flight, against a 4-6 m/s headwind, that took place on May 6, 1908. As a remark, this is the first claimed powered flight mentioned by the Wright brothers after they stopped flying (also a pure claim) in October 1905. The articles, "Aviation in US. Seven french engines for the Wright brothers, L'Aérophile, Apr. 1, 1908, pag. 127" ( http://gallica.bnf.fr/ark:/12148/bpt6k6550620m/f137.image.r=wright%2040%20CV.langEN ) which says that the french company "Barriquaud-Mare" had just delivered seven 40 HP Antoinette like plane engines to the Wright brothers and "Progress of the Wright airplane experiments", Scientific American, May 23, 1908 ( http://www.loc.gov/resource/mwright.05001208/ ) that also talks about french engines, demonstrate, both of them, that the brothers needed in May 1908 far more powerful engines for far less spectacular flights than the ones allegedly performed in 1905. Also on Aug. 8, 1908, the Wright brothers using same french engines flew only 1 min and 45 sec in France, far from 38 minutes in Dayton in 1905 when a considerable weaker engine was used. These brothers have simply no credibility and only their officially witness flights can be trusted. The rest is their own fiction. Tom Crouch: "wing torsion … was first applied in practice by Edson F. Gallaudet in his 1897 craft, tested on Long Island Sound and now on public display at the NASM." "Edson Fessenden Gallaudet (April 21, 1871 – July 1, 1945) was a pioneer in the field of aviation, being the first person to experiment with warped wings in 1896." How could an unqualified man have designed and built an engine in 6 weeks?! "The Wrights wrote to several engine manufacturers, but none met their need for a sufficiently lightweight power-plant. They turned to their shop mechanic, Charlie Taylor, who built an engine in just six weeks in close consultation with the brothers." The article about Taylor ( http://en.wikipedia.org/wiki/Charlie_Taylor_%28mechanic%29 ) also does not bring more light saying just that Taylor was a mechanic hired by Wright Brothers to repair bicycles and "He designed and built the aluminum water-cooled engine in only six weeks, based partly on rough sketches provided by the Wrights." It is not uncommon for a mechanic to adapt a ready made engine to a specific purpose, but to design it from scratch and build it in 6 weeks is simply incredible. The images can be found here, (L'Aerophile, 1 July 1908 http://gallica.bnf.fr/ark:/12148/bpt6k6550620m/f260.image.r=wright.langEN ). They still glided down the slope. How can I believe that the two brothers were able to fly about 40 minutes in 1905 in Dayton, Ohio over a flat pasture if they still needed a hill and strong winds to fly in May 1908. In a letter published in L'Aerophile, in which the two brothers gave technical details about all their claimed flights in May 1908, they also specified the wind speed as being between 4 and 9 m/s. (see L'Aerophile 15 June 1908, http://gallica.bnf.fr/ark:/12148/bpt6k6550620m/f232.image.r=wright%20mai.langEN ). It is self evident the Wright brothers took the true value of Smeaton's coefficient from Langley and they had no real contribution in correcting this constant as some authors have claimed. "In the spring of 1904 … the new machine was heavier and stronger … When it was ready for its first trial, every newspaper in Dayton was notified, and about a dozen representatives of the press were present. … When preparations had been completed … The machine, after running the length of the track, slid off the end without rising into the air at all. Several of the newspaper men returned the next day, but they were again disappointed. The engine performed badly, and after a glide of only sixty feet, the machine came to the ground. The reporters had now, no doubt, lost confidence in the machine, though their reports, in kindness, concealed it. Later, when they heard that we were making flights of several minutes' duration, knowing that longer flights had been made with air-ships, … they were but little interested." "One of the propellers was set to revolve vertically and intended to give a forward motion, while the other underneath the machine and revolving horizontally, was to assist in sustaining it in the air. … After the motor device was completed, two flights were made by my brother and two by myself on December 17th last." Definitely, the flying machine W. Wright talked about in the article is not the one with two pusher propellers, well known from pictures published for the first time in September 1908 in "The Wright Brothers' Aeroplane" that appeared in The Century Magazine (see http://www.loc.gov/resource/mwright.05001574/#seq-1 , page 644 ). In conclusion, two different articles, written by the same Wright brothers and published more than four years and half apart, talk about two distinct airplanes (two different Flyer I) as flying on Dec. 17, 1903. The brothers definitely lied in one of the two texts or in both. There is no way they could have told the truth in both articles. Also W. Wright protested, claiming the article "The Experiments of a Flying Man" was not writtem by him it is intresting to remark that the Library of Congress does not list the article as a fake (see: http://www.loc.gov/item/wright002977/#about-this-item ). Flyer I with a propeller beneath appears in numerous publications as late as May 1906, and even latter, (see: http://www.loc.gov/resource/mwright.05001/#seq-58 ). WB do not seem to protest against their airplane being shown in various pictures with a propeller turning in the horizontal plane. The big trouble with these Wright brothers is that nearly each article, either written by them or other people (impostors or not), has problems, contains things impossible or hard to explain. WB and also O. Chanute, in a lesser proportion, fed the publications with lies or misled them and finally put the blame on somebody else. By A. I. Root, Medina, O., Who Witness Several of Wright Brothers' Flights. It was one of the grandest sights of my life. I stood in front of the machine as it came around a curve. Imagine, if you can, an aluminum locomotive, without wheels, but with 20-foot wings and big, flapping propellers, climbing up into the air right towards you. Such a tremendous flapping and snapping. Everyone was excited except the two Wrights. …". First of all, none of the known airplanes made by WB resembles an aluminum locomotive and secondly they were not equipped with flapping propellers. A. I. Root (a real person) appear cited as witnessing a flying machine that has never existed. The entire article looks more like an investment scam. Most of the newspaper clippings ( see http://www.loc.gov/item/wright002799/ ) collected by the Wright Brothers, especially those between Dec. 17, 1903 and Aug. 8, 1908, look like unreliable articles one can find in tabloids. They simply needed a 90lbf propeller at 24mph considering a 8.73HP engine was available and they calculated that their propeller should be at least 66% efficient otherwise the required 90lbf thrust to keep the plane aloft would not have been reached. Their calculations show just how great the performance of the propeller should have been not how great it really was. This efficiency was never obtained by the people from Wright Experience project. The site http://archive.today/0pne0 says that many tests were effectuated and efficiencies between 75% and 82% were obtained which in not 66%. They also say they reconstructed, with the help of computers, the propellers using badly damaged parts of the original ones. However, in their reconstructions, they made some assumptions that could have alter the efficiency. In conclusion that 66% efficiency is not confirmed. When a team wants to replicate the results or predictions of some inventors the team has to obtain exactly the same results not much better! "Our first propellers, built entirely from calculations, gave in useful work 66 per cent. of the power expended. This was about one third more than had been secured by Maxim or Langley." The text is clear, the two brothers calculated and then obtained a 66% efficiency. An advanced high efficiency propeller, made by Lucien Chauviere, can be seen in L'Aerophile from May 15, 1908, pag. 182 (see http://gallica.bnf.fr/ark:/12148/bpt6k6550620m/f192.image.r=helice.langEN ). It is above the propellers presented by WB on Aug. 8, 1908 and clearly made before WB's propellers became known. Definitely, Europeans or other inventors did not learn from the Wright Brothers how to make efficient propellers. The opposite seems to be true. The theory that (wing warping) ailerons made the flight possible is a pure myth. People flew without ailerons for 20 minutes before the moment the Wright brothers appeared with their ailerons. The Wright brothers appeared performing public flights (starting with Aug. 8, 1908) in a time when other aviators had already flown for about 20 minutes. It is a myth the planes of the two brothers were far superior to other flying machines of the time. Their planes had essentially a single advantage "they could turn in place". 2) They did not have wheels, once landed they were hard to transport. 3) They required a catapult to take off, a huge complication. 4) They were hard to fly. Only to keep such a plane fly straight line the pilot had to steer continuously the tail, wing warping ailerons and the front horizontal rudder! 5) They lack a horizontal tail which made them also unstable in pitch. 1) French engines Bariquand & Marre. 2) Dihedral stability, unlike the alleged Flyer I 1903 and like the french planes. 3) High efficiency propellers, like the french planes. Just because the Wright brothers established some flight duration records in the autumn of 1908 (due to the high quality french engines they used) it does not mean they invented the airplane. The theory that wing warping made the flight possible is a pure myth. People flew without manual roll control for 20 minutes before the moment the Wright brothers appeared with their ailerons. Piloting "Flyer I 1903" is "like balancing a yardstick on one finger, two at one time. If you lose it, it goes — quickly, said Fred Culick …"
(1)"EL SEGUNDO, Calif. (AP) — Aviation experts … have found the Wright stuff — in the hands of modern pilots … — is a little wrong." (2)"I'd say it was almost a miracle they were able to fly it, said Jack Cherne"
(3)"Using that data, they created a computer flight simulator that shows the plane to be so unstable, it is nearly impossible to fly." (4)"It's like balancing a yardstick on one finger, two at one time. If you lose it, it goes — quickly, said Fred Culick …"
(5)"Every pilot, his first try, crashed the simulator. It took less than a second, said Capt. Tim Jorris". (6)"I thoroughly cannot imagine the Wright brothers, having very little experience in powered aircraft, getting this airborne and flying, said Major Mike Jansen. "My respect for what they did went up immediately the first time I took the controls."" (7)"Modifications will include … . A computer feedback system will assist the pilot. We want the experience, but we don't want to kill ourselves, Cherne said."